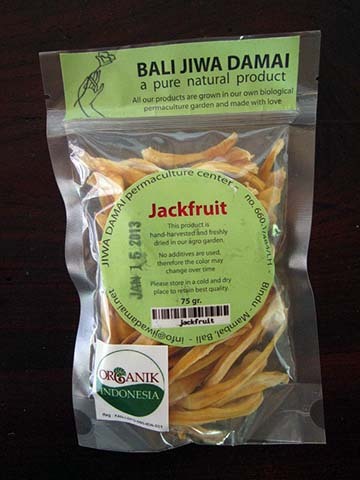 At Jiwa Damai we are producing many different kinds of dried fruit and vegetables. All produce is from our organic farm, harvested and freshly processed in our raw food drying oven. 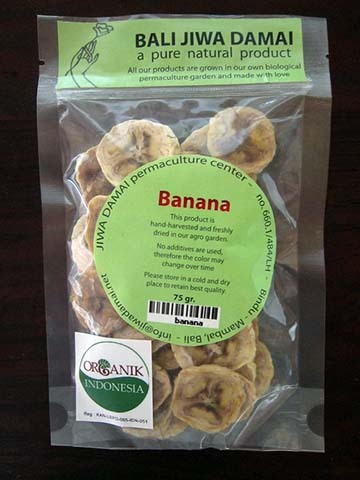 we grow about 8 different varieties of bananas. Each taste is unique and they are best eaten when not too ripe and the skin is still greenish-yellow. They are gently and slowly air dried in our dehydrator to keep their extraordinary flavor. Harvested from trees spotting our garden, our papayas are plump and juicy. When dried, the flavor pops and they make a delicious snack for any time of day or a vitamin-packed addition to any meal. The jackfruit grows high up in the trees and can reach a weight of 10 -12 kg. 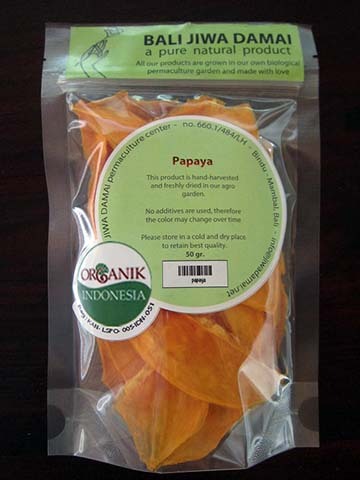 Once the giant fruit is harvested, opened and its inner fruit compartments separated, the fresh fruit is available to be plucked out, its black stone removed, immediately sliced and gently air dried, thus keeping its fresh and aromatic flavor.